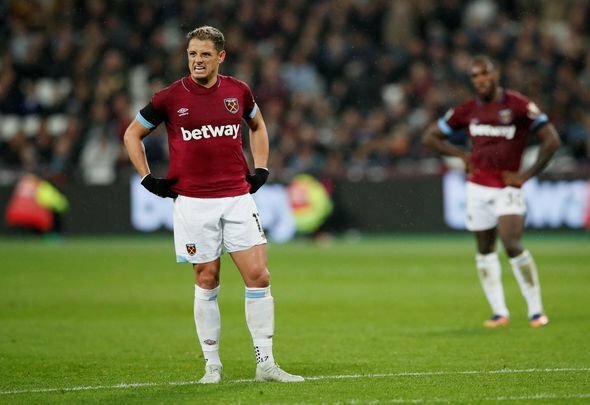 West Ham United striker Javier Hernandez is walking on thin ice at the moment. Called back into the starting line up amid the fallout from the January Marko Arnautovic debacle, he is yet to make a significant impression in the new year. He is now yet to score since netting against Crystal Palace at the start of December and, while he missed some of that time though injury, that’s just not good enough for a frontman of his stature. It was the team’s latest clash with the Eagles on Saturday which saw Hernandez fail to spark into life. Try as he might he just wasn’t able to get in the right positions to make a decisive impact in front of goal, and when he did he failed to take his chance. He’s a good player, we all know that from watching him over the years, but he seems devoid of confidence at the moment. Unfortunately for him manager Manuel Pellegrini doesn’t have the luxury of waiting for him to get back in the goalscoring mood. The Chilean needs victories right away, especially after the team’s horror show of a January. They have arrested their slump with back-to-back draws, but their wait for three points remains excruciating. In fact they haven’t won a game since beating Arsenal on January 12. That’s too long for a side of this quality. Failing to consistently put the ball in the back of the net is one of the reasons for their struggles, and Hernandez will know that he needs to improve fast or face the axe. With Arnautovic slowly being reintegrated back into the team it is surely only a matter of time until the Austrian is a regular starter once again. Hernandez looks like the most likely candidate to be victim of his return. However, the Mexican international only has himself to blame. He has had a real chance to stake a claim for prolonged involvement with the team in recent weeks and he’s failed to take it. He could soon be back on the substitutes bench as a result.